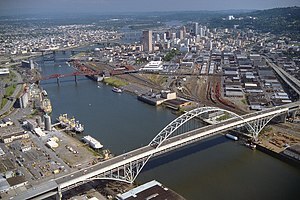 The Willamette River is a major tributary of the Columbia River, accounting for 12 to 15 percent of the Columbia's flow. The Willamette's main stem is 187 miles (301 km) long, lying entirely in northwestern Oregon in the United States. Flowing northward between the Oregon Coast Range and the Cascade Range, the river and its tributaries form the Willamette Valley, a basin that contains two-thirds of Oregon's population, including the state capital, Salem, and the state's largest city, Portland, which surrounds the Willamette's mouth at the Columbia. Originally created by plate tectonics about 35 million years ago and subsequently altered by volcanism and erosion, the river's drainage basin was significantly modified by the Missoula Floods at the end of the most recent ice age. Humans began living in the watershed over 10,000 years ago. There were once many tribal villages along the lower river and in the area around its mouth on the Columbia. Indigenous peoples lived throughout the upper reaches of the basin as well. ↑ "Facts About the Willamette River". Willamette Riverkeeper. Archived from the original on October 31, 2016. Retrieved November 16, 2016. ↑ Robbins, William G. "Willamette River". The Oregon Encyclopedia. Portland State University and the Oregon Historical Society. Retrieved May 19, 2014. ↑ "Water-Year Summary for Site USGS 14211720". U.S. Geological Survey. Retrieved January 8, 2017. ↑ "Willamette River Multi-Purpose Development in the 1930s" (PDF). Army Engineers and the Development of Oregon: A History of the Portland District U.S. Army Corps of Engineers. U.S. Army Corps of Engineers. 1983. p. 107. Archived from the original (PDF) on February 21, 2014. ↑ These are the average, maximum, and minimum flows recorded during the period of record (1973–2015) for this gauge. The greatest recorded Willamette flood, which occurred in December 1861, produced a much larger maximum of 635,000 cubic feet per second (18,000 m3/s) in Portland. This page was last changed on 7 February 2019, at 15:45.